Butterwick, Richard (1998). Poland's Last King and English Culture: Stanisław August Poniatowski, 1732–1798. Clarendon Press. ISBN 978-0-19-820701-6. Retrieved April 29, 2012. ^ Hays, Jeffrey. 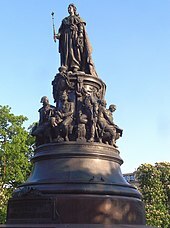 "Catherine the Great". factsanddetails.com. Retrieved January 23, 2019. 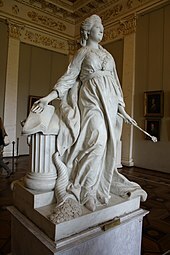 ^ "Catherine The Great". History Channel. Retrieved March 11, 2015. 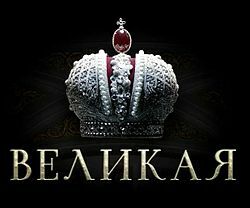 ^ "The Russian Crown Jewels". Famousdiamonds.tripod.com. Archived from the original on June 27, 2014. Retrieved June 11, 2014. ^ "Diamond Fund Treasures". Almazi.net. Retrieved June 11, 2014. ^ a b "The Religion of Russia". Retrieved March 24, 2007. ^ Mamonova, Natalia (2016). "Naive Monarchism and Rural Resistance In Contemporary Russia". Rural Sociology. 81 (3): 316–42. doi:10.1111/ruso.12097. Retrieved September 12, 2017. Elizabeth Petrovna, also known as Yelisaveta or Elizaveta, was the Empress of Russia from 1741 until her death. She led the country during the two major European conflicts of her time: the War of Austrian Succession (1740–48) and the Seven Years' War (1756–63). 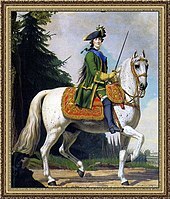 Peter III was Emperor of Russia for six months in 1762. He was born in Kiel as Charles Peter Ulrich of Schleswig-Holstein-Gottorp, the only child of Charles Frederick, Duke of Holstein-Gottorp, and Anna Petrovna. The German Peter could hardly speak Russian and pursued a strongly pro-Prussian policy, which made him an unpopular leader. He was deposed and possibly assassinated as a result of a conspiracy led by his German wife, Princess Sophie of Anhalt-Zerbst, who succeeded him to the throne as Catherine II; however, another theory suggests, his death could also have been the result of a drunken brawl with his bodyguard, whilst he was being held captive after Catherine's coup. Yemelyan Ivanovich Pugachev was a Yaik Cossack who led a great popular insurrection during the reign of Catherine the Great. Pugachev claimed to be Catherine's late husband, Emperor Peter III. Alexander Pushkin wrote a notable history of the rebellion, The History of Pugachev, and recounted the events of the uprising in his novel The Captain's Daughter (1836). Prince Grigory Aleksandrovich Potemkin-Tavricheski was a Russian military leader, statesman, nobleman and favourite of Catherine the Great. He died during negotiations over the Treaty of Jassy, which ended a war with the Ottoman Empire that he had overseen. 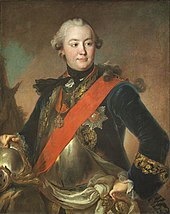 Count Alexei Grigoryevich Orlov was a Russian soldier and statesman, who rose to prominence during the reign of Catherine the Great. Count Alexei Grigorievich Razumovsky, was a Ukrainian-born Russian Registered Cossack who rose to become the lover and, it was even suggested, the morganatic spouse of the Russian Empress Elizaveta Petrovna. 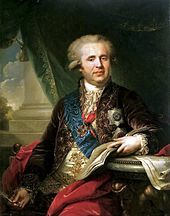 Count Nikita Ivanovich Panin was an influential Russian statesman and political mentor to Catherine the Great for the first 18 years of her reign. In that role, he advocated the Northern Alliance, closer ties with Frederick the Great of Prussia and the establishment of an advisory privy council. His staunch opposition to the partitions of Poland led to his being replaced by the more compliant Prince Bezborodko. 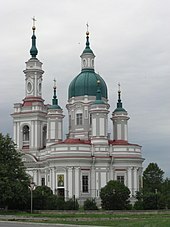 The Russian nobility originated in the 14th century. In 1914 it consisted of approximately 1,900,000 members. Orlov is the name of a Russian noble family which produced several distinguished statesmen, scientists, diplomats, and soldiers. The family first gained distinction in the 18th century through the achievements of five Orlov brothers, of whom the second eldest was Catherine the Great's paramour, and two younger brothers were notable military commanders. Princess Tarakanova, was a pretender to the Russian throne. She styled herself, among other names, Knyazhna Yelizaveta Vladimirskaya, Fräulein Frank, and Madame Trémouille. Tarakanova is a later name, used only in entertainment, apparently on the basis of how she lived her last months and died. In her own time, she was not known by that name. 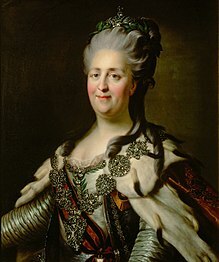 During and after the reign of the flamboyant and powerful Empress Catherine II of Russia, whose long rule led to the modernization of the Russian Empire, many urban legends arose, some false and others based on true events, concerning her sexual behavior. 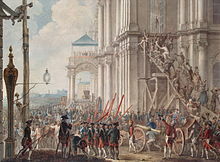 Pugachev's Rebellion of 1773-75 was the principal revolt in a series of popular rebellions that took place in the Russian Empire after Catherine II seized power in 1762. 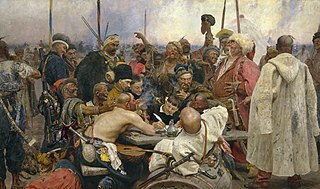 It began as an organized insurrection of Yaik Cossacks headed by Yemelyan Pugachev, a disaffected ex-lieutenant of the Imperial Russian Army, against a background of profound peasant unrest and war with the Ottoman Empire. After initial success, Pugachev assumed leadership of an alternative government in the name of the assassinated Tsar Peter III and proclaimed an end to serfdom. This organized leadership presented a challenge to the imperial administration of Catherine II. 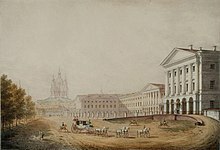 The Russian Age of Enlightenment was a period in the 18th century in which the government began to actively encourage the proliferation of arts and sciences, which had a profound impact on Russian culture. 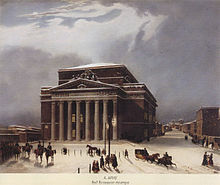 During this time, the first Russian university was founded, a library, a theatre, a public museum, as well as relatively independent press. 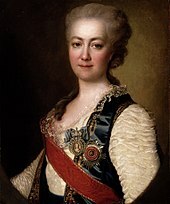 Like other enlightened despots, Catherine the Great played a key role in fostering the arts, sciences, and education. 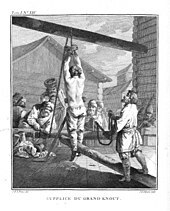 The national Enlightenment in the Russian Empire differed from its Western European counterpart in that it promoted further modernization of all aspects of Russian life and was concerned with abolishing the institution of serfdom in Russia. The Pugachev Rebellion and French Revolution may have shattered the illusions of rapid political change, but the intellectual climate in Russia was altered irrevocably. Russia's place in the world was debated by Denis Fonvizin, Mikhail Shcherbatov, Andrey Bolotov, Ivan Boltin, and Alexander Radishchev; these discussions precipitated the divide between the radical, western, conservative and Slavophile traditions of Russian thought. Intellectuals often used the term prosveshchenie, promoting piety, erudition, and commitment to the spread of learning. Catherine the Great is a 1995 television movie based on the life of Catherine II of Russia. It stars Catherine Zeta-Jones as Catherine, Jeanne Moreau as Empress Elizabeth and Omar Sharif as Alexis Razumovsky. 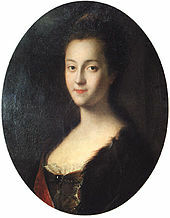 Elizaveta Romanovna Vorontsova was a mistress of Emperor Peter III of Russia. During their affair, Peter was rumored to have intentions of divorcing his wife Catherine to marry Vorontsova. Count Grigory Grigoryevich Orlov (1734–1783) was the favorite of Empress Catherine the Great of Russia who presumably fathered her son. He led the coup which overthrew Catherine's husband Peter III of Russia, and installed Catherine as empress. For some years, he was virtually co-ruler with her, but his repeated infidelities and the enmity of Catherine's other advisers led to his fall from power. 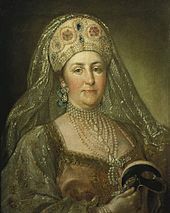 Mary Hamilton, or Maria Danilovna Gamentova, was the lady-in-waiting of Empress Catherine I of Russia and a royal mistress of Tsar Peter the Great of Russia. She was executed for abortion, infanticide, and theft and slander of Empress Catherine. She is pointed out as one of the possible inspirations for the song Mary Hamilton.